The man who spent years behind the lens during President George H.W. Bush's time as president remembers him as a man of honor. David Valdez, chief official White House photographer from 1989 to 1993, reminisced about his years observing the former president on Cheddar Monday, just days after Bush passed away at age 94. "It was a great honor and privilege to be a part of that," Valdez said. "I'm just a guy from a small town in Texas, and to be elevated to be the president's photographer was just amazing. We traveled to 75 countries and all 50 states. So there was a lot of world history that happened during his time in office." Valdez took countless photos of the first family. But the one he remembers best is of George and Barbara Bush sitting in bed with their grandchildren. "As a photographer, for me it's become my iconic image," Valdez said. "Life Magazine wanted to send a photographer up there to take some pictures the summer before he was going to run for president. He said no, he was on vacation. We went back and forth. I talked to Barbara Bush about it. She suggested coming over first thing in the morning. 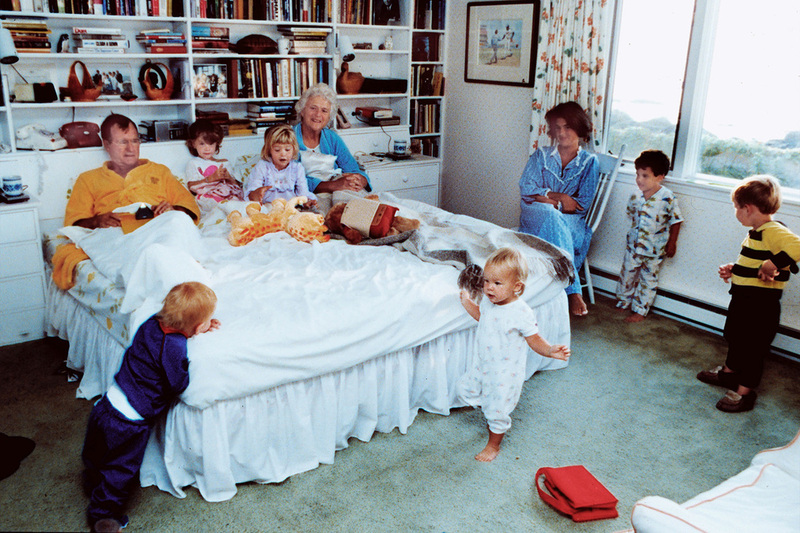 I did that, sat on the end of the bed with George and Barbara Bush and then the grandchildren started coming in. I took a couple of shots, and the rest is history there." Valdez was there for some of Bush's biggest moments, both politically and personally. "When his mother was on her deathbed, he had me go into her bedroom and take one last photo with he and his mother," Valdez remembered. "And then when his daughter Dorothy had her first son, Sam, we went to the hospital and I took pictures of Sam in the nursery." "He at one point called me a member of his family. They considered me a part of their family. And I appreciated that, but I always remembered that I was a staff person, and it was actually my job that put me in proximity. But they were so warm and gracious to me." Bush's time as the commander-in-chief came with its share of challenges, some of which deeply affected the then-president, a combat veteran. Bush was only 18 years old when he joined the Navy to fight in World War II. According to his biographer Jon Meachem, he may have been the Navy's youngest flying officer. "The hard part was he had been in combat himself," Valdez said. "He was the youngest Navy fighter pilot in World War II. He was shot down, lost two of his crew members, and now as commander-in-chief he was sending men and women off to war. And that weighed real heavy on him. I remember him having a difficult time with that." During Bush's term, the Berlin Wall came down. Valdez said his political advisors wanted him to go stand on the wall, wave the flag, and say "we won the Cold War." But Bush refused, saying "it's their victory." "He didn't go beating on his chest saying, 'Look what I accomplished,'" Valdez said. "It was, 'Look what those people accomplished, and now they're free.' He was proud of that. I know the political people wanted him to go and take advantage of that politically, but that wasn't in his character. He was a man of honor and dignity, and understood world politics probably better than anybody." But Valdez said the most important thing to Bush was his family. His passing comes eight months after the death of his wife, Barbara. Valdez thought he would die of a broken heart, but said the two are together now. "For the Bush family and President Bush with all the titles that he had as youngest Navy fighter pilot in World War II, and an oil man, and a congressman, and director of the CIA, and vice president, and all the other things that he did, the most important titles to him were husband, father, and grandfather."